Recipe keeper and flip stand saves your pages from splatters and spills as you cook while it stores and displays the instructions for your favorite dish. Vertical flip stand has durable 3-ring construction which allows you to redistribute recipes into the correct category heading with the 12 included tabbed dividers as well as add to the book with more pages when needed. (Additional refills available for purchase separately). 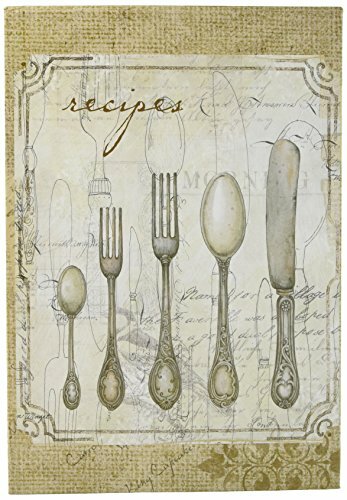 The included 24 pvc free sheet protectors hold full sized 8.5 x 11-inch sheets so recipes you find online or print from Facebook can be added to your personal collection quickly. Storage is a snap since this book closes flat to be easily included on the shelf with your other cookbooks. Nothing says home quite like the kitchen. The story of our lives is lived there and CR Gibson offers you stylish ways to record and organize the heart of these moments. Blending rustic with the elegant, the Perfect Setting collection by Susan Winget uses classic colors and a timeless kitchen utensil design that will fit into anyone's color scheme. When you want the best in office and giftware, trust C.R. Gibson, synonymous with quality for more than 140 years. Search for the recipe file box, coupon keeper, pocket page recipe book, coffee mug and page flag set in the same Perfect Setting motif or see additional refreshing and colorful patterns by other renowned artists and sought-after designers by searching for products from C.R. Gibson.